The administration themes were a request from a customer. He does own development with developer, stage and production servers and wanted a subtle way to see which server he was currently changing. 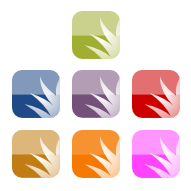 A theme consists of a color set, background images, the icon and a progress animation. At the moment 7 colors are available in trunk. Because of the favorite icons it is easier to spot the right tabs, too.